If you’re looking for the Wednesday Wandering, just page back one and join in the discussion of the art of Melissa Zink and the question of what the physical book means to you. 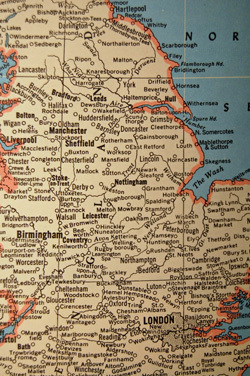 Then come back and join me and Alan as we venture into the roots of place names. JANE: We were venturing into the territory of the exotic names attached to our landscapes that connect us to the indigenous peoples who lived here before us and – in places like New Zealand and New Mexico – still live with us. Alan, you’ve already given an example in the place of the man with the big knees and the nose flute, but do you have another? ALAN: Yes I do – but first I need to digress slightly and explain a bit of background. In New Zealand the Maori language is ubiquitous. All the tribes spoke the same language and had a common culture. That influence remains very strong and so Maori names for places are used all the time all over the country, though they may sound a little odd to foreign ears. My favourite is Wanganui (that’s pronounced “one-gu-noo-ee”). A local TV comedy programme used to have a segment they called “The Deliberate Mispronunciation Of Maori” and they mangled that into “wan-gan-you-eye”, which I found quite hilarious! Even my Maori friends laughed at it. 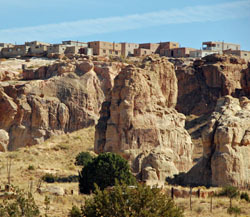 JANE: I’d like to start with a place I talked about in my Wednesday Wandering for 10-27-10 – Acoma Pueblo. “Acoma” falls into the relatively mundane name category. It translates from its original Keresan as “people of the white rock.” In earlier texts, Acoma is refereed to as “Ahacus” and later “Acuco,” which shows how often words are transliterated differently by different listeners. Showing that names are subject to change, Acoma has picked up a modern nickname – “Sky City” – which celebrates its elevated location. That’s just one name, from one language group. Here in the American Southwest, we’re blessed with a great number of tribes, each with their own languages. We have Navajo, Apache, Zuni, and Hopi. 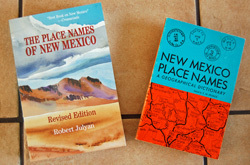 Although they’re frequently lumped together, the various “Pueblo” groups speak languages that fall into several distinct groups: Tiwa, Tewa, Towa, and Keresan. ALAN: Ah! You’ve already arrived at the place I was heading to. In Australia, the situation was quite similar to what you have in New Mexico. The Aboriginal tribes did not have a common culture and there were literally hundreds of mutually incomprehensible languages. Nevertheless, Australia still uses many Aboriginal place names which sound somewhat exotic to our ears and which, because of the different languages, also seem quite dissimilar to each other. For example, Western Australia is mostly desert, so water is obviously very important. In one Aboriginal language the “oo” suffix means “by water” and so we have towns called Wanneroo and Innaloo. Another Aboriginal language in the same area uses the “up” suffix in a similar context, hence Joondalup and Karrinyup. Those two tribes lived close together and neither could speak the other’s language. But their heritage remains. JANE: Ah, hah! I see now why in his novel The Last Continent Terry Pratchett named that one town “Buggerup” and why, despite the obvious joke, the name seemed to fit so nicely into Australian naming structures. ALAN: I seem to recall that he also had a place called “Didjabringabeeralong” which also seems to fit nicely into this structure but which is, of course, a reference to something else entirely! Pratchett is a very clever man. Sometimes the sense of history associated with the names used by various indigenous people also shows that no matter how different our cultures are, we all have a shared sense of place and values. This can lead to surprising resonances. For example I once stumbled upon a small, out of the way cottage by the coast in the far north of New Zealand. It had a nameplate attached: “Wharemoana.” That translates as House (“Whare”) of (or by) the sea (“moana”). In other words, prosaically, Seahouse or, stretching it a little bit, Seahouses. And the reason that resonated with me is that my father’s side of the family comes from a town in Northumberland in the north of England which is called Seahouses. Suddenly I felt at home even though I was on the far side of the world. JANE: I may be a sentimentalist, but that actually made me tear up. It’s wonderful you found a piece of home away from home. I suspect this is the very impulse that leads to so many colonial places being named “New” something – a desire to feel you’ve brought a bit of home to your new home. ALAN: And New Zealand is the perfect example of that. Zealand (or more accurately Zeeland) is an area of Holland and I assume that’s where the Dutch explorer Abel Tasman came from. He was the first European to see New Zealand, though he didn’t land, he just sailed on by. JANE: This question of names and what they mean to those who live on the landscape brings me to a change I’ve seen happening during the time I’ve lived in the Southwest – the reclaiming by indigenous peoples of the names they gave to their landscape. It’s a complex topic, though, so I’d like to save for next week. 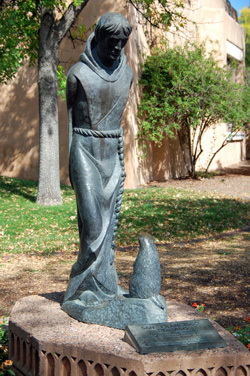 Albuquerque Museum. 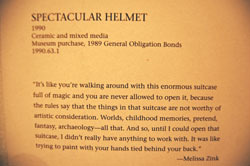 When I went to read the title (“Spectacular Helmet” by Melissa Zink), the quotation included on the tag drove everything else out of my mind. “Its like you’re walking around with this enormous suitcase full of magic and you are never allowed to open it, because the rules say that the things in that suitcase are not worthy of artistic consideration. Worlds, childhood memories, pretend, fantasy, archaeology—all that. And so, until I could open that suitcase, I really didn’t have anything to work with. It was like trying to paint with your hands tied behind your back.” Melissa Zink. I was astonished. I’d thought the words meant so much to me because I was a writer who had her own “enormous suitcase full of magic” and regularly delved into it – despite my awareness that, in the academic world in which I did my education, “the things in that suitcase are not worthy of artistic consideration.” However, here was Michael – a professional mathematician – finding himself moved by those words as well. Now, admittedly, Michael is an eclectic personality, interested in far more than mathematics, but his statement made me wonder how many of us carry around private suitcases that we’re apprehensive about opening in public lest the contents be deemed unworthy of consideration. We did. Later Jim transcribed the quote and I sent Michael a copy. That might have been the end of it except that, a week or so later, when I was at the library researching something else entirely, I came across a book about Melissa Zink’s art. It was titled The Language of Enchantment and written by Hollis Walker, a gallery owner who had loved Melissa Zink’s work since she first encountered it in 1978 and who had represented Zink since 1993. I turned the pages, looking at the photographs of Zink’s art, feeling rather like Alice gazing through the looking glass into a world that belonged to someone else but nonetheless was deeply familiar. I loved the narrative dioramas from the series “The (almost) True-To-Life Adventures of Gypsy Dog and Hattie Macwilliam in Darkest Artland.” Later in her career, Zink moved from these dioramas to “wall-hung pieces with two-dimensional aspects” such as the piece that had caught my eye in the Albuquerque Museum. Later still, she tightened her focus down to letters and words, creating unique alphabets or illustrating a single word. No matter how abstract the work became, the sense of story remained. Most of Zink’s works were small but, when she tried her hand at works on a larger scale, the written word remained her inspiration. Her “Guardians” were “The Minister of Words,” “Chamberlain of Letters,” and “Book Warden.” Walker’s book showed Zink impishly peeking out from behind the three tall bronze figures, their androgynous heads set atop flattened bodies made from text. How about you? 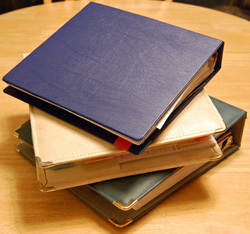 How do you feel about physical books? About the book experience? Are words to read enough or do you, like Melissa Zink, feel there is something to the book itself? forward to. Wolf Fest 2012 will be held on the University of New Mexico campus: on Smith Plaza and in the Dominguez Courtyard near Zimmerman Library. Q: What is Wolf Fest 2012? A: Wolf Fest 2012 is a day-long festival being held with the purpose of raising awareness of the plight of the Mexican wolf. It will feature booths from various groups interested in ecological and wild life issues, letter writing stations, and other events. 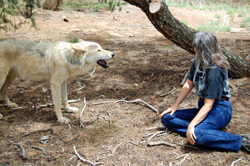 Wild Spirit Wolf Sanctuary (that’s one of their residents in the associated photo) will be attending with one of their wolf ambassadors, members of their knowledgeable staff, and a bunch of wolf-related gift and education items. Q: Why is UNM hosting this event? A: For one, the lobo (that’s Spanish for “wolf”) is the university mascot so it’s a perfect fit. For another, various campus organizations, including the Biology Undergraduate Society, the Biology Graduate Student Associations, and the Wilderness Alliance of UNM were willing to put in a huge amount of work to set up the event. They’re aware that the Mexican Wolf is in need of advocates who can provide informed and intelligent discussion as to why our wild places need wolves. Q: No offense, Jane, but what the heck is a Fantasy Writer doing appearing as one of the speakers? A: No offense taken! Actually when I was first e-mailed my invitation, that’s exactly what I wrote to S. Kevin McCormick (one of the organizers). 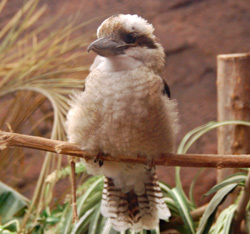 After all, the other invitations had gone out to science or ecological awareness groups such as Defenders of Wildlife, the Center for Biological Diversity, and the Albuquerque BioPark. Since I am indeed passionate about wolves and especially about how often wolves are misrepresented in fiction, folklore, and supposed fact, I am delighted to participate in Wolf Fest 2012 and help set the record straight. Q: So, where will you be? And when? A: Weather permitting, I’ll be in the Dominguez Courtyard between 10:00 a.m. and 2:00 pm. This courtyard is over near Zimmerman Library. I’ll be there along with the folks from Wild Spirit Wolf Sanctuary. The organizers kindly arranged for this special area so that the ambassador wolf would not be overwhelmed by crowds. Then they offered to include me, so I would have a more controlled environment in which I could talk with those who dropped by. I was very happy to accept. After all, this means I get to spend several hours with one of the wolves! Q: I like wolves well enough, but what if I wanted to come and talk to you about writing or some of your non-“Blind Seer books”… Is that, okay? A: Absolutely. The folks from UNM’s book store have ordered copies of my books for sale, so I’ll be there in my “writerly” as well as “wolf-fan” capacity. I’d be very happy to answer any questions I can about writing, both as a craft and a business. Please remember, no question is “dumb.” During my very first book signing, I was able to reassure a budding novelist that he wasn’t expected to come up with cover art for his book. The look of relief on his face permanently addicted me to answering questions about all aspects of writing. which is (probably) the longest place name in the world. The English translation of this Maori name is “The summit where Tamatea, the man with the big knees, the climber of mountains, the land-swallower who travelled about, played his nose flute to his loved one” which also makes my mind boggle a little bit! Big knees? JANE: I have a feeling the blog program is going to have trouble spacing a word that long. ALAN: I bet he had a tummy ache as big as the name after he swallowed it all! There was a little snippet about this hill on the TV a few years ago. A reporter wrote the name down on a piece of paper and went round a group of people in a pub asking them to pronounce it. Everybody made a complete mess of it of course. Finally he approached a cool looking Maori guy who was hunched over his beer and paying no attention to what was going on. The reporter presented his piece of paper and asked the man to pronounce the name. The man glanced casually at the paper and said, “You spelled it wrong.” Then he returned to his beer and ignored the reporter again. JANE: And had he spelled it wrong? ALAN: Only the man with the big knees knows, and he’s not telling. JANE: I’ve got a Spanish hill name for you that’s almost as good: Nuestra Senora del la Luz de las Lagunitas.” The name translates as “Our Lady of the Light of the Little Lakes.” This is the name of a volcanic plug in the valley of the Rio Puerco of the East (that is the Dirty or Muddy River of the East; there’s one in the west as well). A now-deserted village in the area had the even more pretentious name of Nuestro Senora de la Luz San Fernando y San Blas. Despite this appeal to the lights of both Saint Ferdinand and Saint Blais, the settlement failed. Today even its precise location is uncertain. ALAN: Of course, not all place names are necessarily exotic or full of hints about mysterious pasts and legends. This unimaginative naming scheme stood me in very good stead when I came to New Zealand which has the aptly named North Island to the North and the even more aptly named South Island to the South. In the north of the North Island, there’s a cape called North Cape. To the West and the East, New Zealand also has both a West Cape and an East Cape. It was clear to me that the European names of the various geographical features had all been assigned by a Yorkshireman – as indeed they had. The famous explorer Captain James Cook came from Whitby, which is a small suburb to the North of Wellington, so he didn’t have to travel very far to start naming things. JANE: We have our share of practical names here, but sometimes even the practical hints at something fascinating that happened in the past. And that helps to give a sense of continuity, of roots that anchor the place into the world. It’s one of the techniques that an author can use to bring their fictional places alive and it ties in quite neatly to my current fascination with world building, so let’s continue next time! available both in e-book formats and as a print on demand publication. To my astonishment, many of the people who love Changer aren’t aware that there is a sequel. Part of this is no doubt due to the radically different cover art approach and the title Avon insisted we use. Although issued under the title Legends Walking, Changer’s Daughter was my original title. In the introduction to this new edition, I discuss how the title came to be changed. I also unveil some of the behind-the-scenes issues and interests that contributed to the book’s evolution. The introduction is not the only new material included in Changer’s Daughter. I’m also including the only (at least to this point) athanor short story. “Witches’-broom, Apple Soon” was first published in 2004 in the anthology Faerie Tales, edited by Martin H. Greenberg and Russell Davis. It’s a story of Shahrazad the coyote, Demetrios the faun, witches’-brooms and a woman who hunts them. Over the years, the anthology has become increasingly hard to find, so I decided to reprint the story here. There’s also a spiffy new cover designed by Pati Nagle. There’s a funny story to go with the cover… Initially, when we were looking at art, Pati sent me a series of nice but predictable coyote pictures. Even without seeing them, you know what I mean: a stately standing coyote, a coyote howling, a coyote quizzically studying the photographer. Nice, but not with the flare I’d been hoping for. I asked Pati to surprise me and she certainly did! Her second search came up with the magnificent snarling fellow who graces the front of Changer, but it was another photo that really startled me. I’d been re-reading the manuscript of Changer’s Daughter in the process of preparing it for publication. After viewing the second selection of photos Pati sent me, I e-mailed her: “You’ve just sent me a picture of the scene I was reading today!” That photo became the cover of Changer’s Daughter. I invite you to see if you can guess which scene I was reading at the time. So, even if you already own Legends Walking, there’s lots here to make this book an appealing addition to your collection. 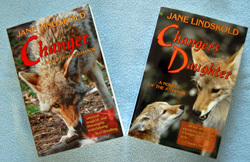 Changer’s Daughter is available both for Kindle and for Nook. If you prefer a book to hold in your hands (my archaic preference) you can also buy the print-on-demand version from Create Space. detail. I am immune to the charm of entering long lines of computer code. Tax forms give me hives and palpitations. When I say I like detail, what I mean is I love knowing what underlies the familiar. If you’ve been reading the Thursday Tangents, you’ve probably figured this out. Poor Alan Robson is more patient than you know about my myriad questions. Of course, he gets in a few of his own, now and then. I really get excited by how ideas fit together, as anyone knows who has had the misfortune to be in the vicinity when I have a new obsession. Then I will happily prattle on about whatever has just caught my fancy. This interest in detail is really not a bad trait for a writer of Fantasy and Science Fiction, since these are genres where knowing where things come from can save a writer from making embarrassing errors. So how do you start learning about something about which you know nothing? Do you need to sign up for a course at the local college or prowl the web? No. Nothing so complex. The former is time consuming and the latter demands a real skill in assessing your sources for validity. Let me give an example. When I was writing the Firekeeper books, I wanted to have the economy of New Kelvin be based in part on being able to supply a commodity not available anywhere else. I decided to settle on silk. Why? I like silk. However, despite the fact that I like silk, all I knew about how it was produced was that it came from what was usually called a silkworm. From reading the excellent novel Bridge of Birds by Barry Hughart, I knew these weren’t worms of the sort I dig up in my garden, but more like caterpillars. Clearly, if I was going to base an export economy on silk, I needed to know more. Surely, you say, sericulture (that’s the cultivation of silkworms) is not something you’ll find covered in children’s books. Guess what? It is! Even in our relatively small local library system, I found several that covered the subject. I took these home. From their pages, I acquainted myself with all sorts of interesting facts. For example, an adult silkworm moth has a wingspan of about two inches. It reproduces sexually. Adult life span is brief – a few days or weeks. I learned that a silkworm’s cocoon is made from a single unbroken thread more than a mile long. Sericulturalists heat-kill the moths to keep them from breaking the cocoon when they emerge. And, yep, to get the thread, the cocoons need to be unwound – again, without breaking that thread. Whoa! There I go again… Still, how many of you have some beauty in your fantasy novel wearing a silk gown? Does she live in a land of ice and cold, the type of climate where silkworms could never thrive? I guess there’s a good trade route available. There is? Then you’ve learned something about your world. One of the great things about children’s books as sources is that, since they’re written for young people, nothing is assumed. Words are defined. Often the definitions are repeated in a simple glossary. Another great thing is that there are pictures, not only photographs, but drawings, including cut-away diagrams that show you how things work. Those pictures and glossaries can be a gem beyond price. Armed with the knowledge you can garner from them, you’re prepared to move ahead. Maybe you’ll move to texts written for older children. Maybe you’ll jump all the way to texts written for adults. Maybe now you’ll be able to tackle that interesting website that was so confusing the first time. Or maybe you’ll realize that you have enough to get you going with that part of your story which you didn’t feel was coming out quite right. Or maybe you can tell me how you feel about detail. Do you love it or does it drive you up the wall?